GAINESVILLE, FL: Dr. Guanghui (George) Lan, Assistant Professor of Industrial and Systems Engineering at the University of Florida, will deliver a seminar entitled, “Stochastic Approximation for Nonconvex and Simulation-based Stochastic Programming.” The seminar will be in FLG 0245 at 4 p.m. on Thursday, October 18. ABSTRACT: We introduce a new stochastic approximation (SA) type algorithm, namely the randomized stochastic gradient (RSG) method, for solving an important class of nonlinear (possibly nonconvex) stochastic programming (SP) problems. We establish the complexity of this method for computing an approximate stationary point of a nonlinear programming problem. We also show that this method possesses an optimal rate of convergence if the problem is convex. We discuss a variant of the algorithm which consists of applying a post-optimization phase to evaluate a short list of solutions generated by several independent runs of the RSG method, and show that such modification allows to improve significantly the large-deviation properties of the algorithm. These methods are then specialized for solving a class of simulation-based optimization problems in which only stochastic zeroth-order information is available. Promising numerical results will also be presented along with these theoretical developments. This is a joint work with Saeed Ghadimi. 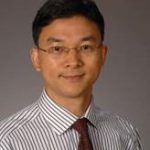 BIO: Dr. Guanghui (George) Lan obtained his Ph.D. in Operations Research from Georgia Tech in 2009 and joined the ISE department at UF as an Assistant Professor thereafter. 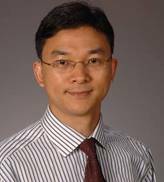 His research interests lie in theory, algorithms and applications of nonlinear and stochastic optimization. Dr. Lan’s academic honors include the winner of INFORMS Computing Society Student Paper Award (2008), INFORMS George Nicholson Prize Competition second place (2008), Mathematical Optimization Society Tucker Prize Finalist (2012) and the winner of INFORMS Junior Faculty Interest Group (JFIG) paper competition (2012). His research is funded by NSF and appears in Mathematical Programming and SIAM Journal on Optimization.